In short, the photographic portrait is the most ubiquitous of the medium’s genres. Their prevalence in the public and private consciousness means it’s easy to forget the complex nature of what is shown and how they are produced. Clarke (1997) points out: “The portrait photograph is… the site of a complex series of interactions – aesthetic, cultural, ideological, sociological, and psychological.” (p.102) We could add economic too. These interactions involve give and take along each of these dimensions with varying levels of control exerted by the photographer and subject depending on the specific circumstances of each portrait. At times the photographer is subservient to a client, celebrity, art director, or other person with power. On other occasions the photographer exerts control such as with travel, street, family, fashion, friends, self- portraiture, etc.. The locus of control in these circumstances determines – in large measure – the final representation of the subject in the frame. It is always a negotiation (except for candid portraits – see later). At a simplistic level a photographic portrait is a representation of a person’s visible appearance as revealed in their face. Hence the most common form is the head and shoulders shot where the face occupies a greater proportion of the frame allowing for close scrutiny. The greatest exponent of this ‘classical’ approach to the photographic portrait in the twentieth century was the Armenian-Canadian Yousuf Karsh (1908-2002). Starting in 1933 he undertook over 15,000 portrait sittings over a 60 year period producing over 150,000 negatives. Over time, the formal head and shoulders portrait has become a cliché associated with annual school photographs, corporate reports, police mugshots, passports photos, and formal portraits of ‘the great and the good’ (politicians, monarchs and celebrities). Given it’s inherent descriptive purpose photographic portraiture is not inclined to innovation and creative shifts. The single biggest innovation in portraiture was the shift from character studies to social portraits by the Scottish team of Hill and Adamson in the 1840s. They showed how the portrait could expand to tell viewers about the life of the person depicted. This was taken further by German photographer August Sander (1876-1964) who all but erased his sitter’s character in favour of presenting them as archetypes of particular occupations. Almost a century after Hill and Adamson, Arnold Newman (1918-2006) combined their approach with a modernist aesthetic in a style often referred to as ‘environmental portraiture’. Newman frequently depicted his sitters with objects or spaces closely associated with their life’s work. We see Jackson Pollock in his Long Island studio in 1949 surrounded by paint pots and brushes or (a menacing looking) industrialist Alfred Krupp at the Krupp factory in Essen in 1963. Often the formal design of his images acts as a metaphor for the work of the sitter. With this approach he compresses much more information about the sitter’s life into his frame than is possible in a simple head and shoulders shot. 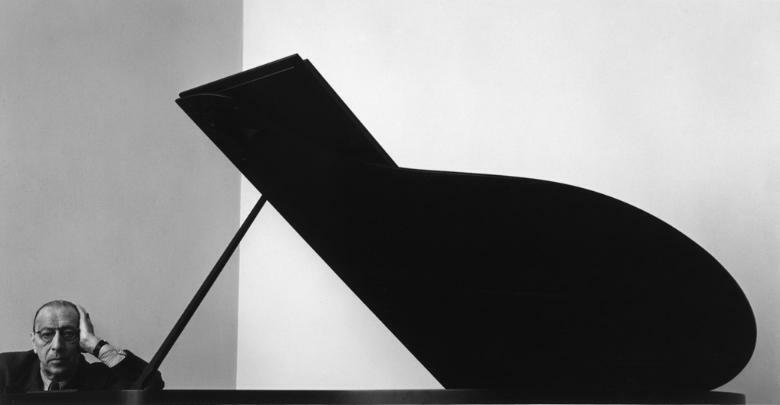 The most famous example of Newman’s style is his 1946 portrait of Russian pianist and composer Igor Stravinsky taken in New York (below). The innovative composer is squeezed into the bottom left corner of a horizontal image dominated by the lid of a grand piano symbolising the musical notation Stravinsky was famed for manipulating to startling effect. Attempts to depart from the traditional ‘classical’ approach and the (equally common) ‘social’ portrait style immediately run into many fundamental questions about the nature of a photographic portrait. Does a portrait have to show the face of the sitter? Could the back of a head suffice? Karsh’s enigmatic portrait of cellist Pablo Cassals strongly suggest it can. Similarly, can a single attribute of a person’s physiognomy stand as a portrait of the whole person even if their face isn’t shown? A wrinkled brow, a craggy hand or dishevelled clothing perhaps. Tim Booth’s magnificent A Show of Hands makes this case beautifully. The portrait is usually thought to involve deliberate engagement between a photographer and a sitter to produce a representation of the latter’s appearance and character. Does this rule out the notion of candid portraits? Clarke (1997) seems to in arguing that Walker Evans’s subway images are not portraits. There are other questions but it would take too long. The larger point I am making is that portraiture is dominated by conventions that constrain creativity in this genre perhaps more than many others. It is therefore a significant challenge to come up with innovative portraits which fulfil the essential purpose of revealing something about the subject and their life. Innovate too far and the notional subject is apt to become a compositional device in a photographer’s fiction/concept of something else entirely. Grahan Clarke, The Photograph, Oxford University Press: Oxford. 1997. Lots to think about and explore here. Great information! I like to consider some photos to be a small glimpse into the photographer’s mind for sure. For instance, I take a lot of front side photos, and a lot of walking away photos of humans and animals, because I know one day I will lose those people or animals and it gives me preparation for that, I have a photo of that ahead of time. A tangible grasp of what is to come, a subconsciense grasp at dealing with reality for myself. I’ve had a lot of loss as have others.